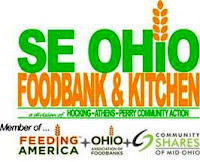 LOGAN – The Southeast Ohio Foodbank is seeking volunteers for the Commodity Supplemental Food Box packing event Saturday, Oct. 5 from 9 a.m. to noon. The Southeast Ohio Foodbank and Kitchen is located at 1005 C.I.C Dr. in Logan. “We are asking for volunteers to join us for this fun and meaningful activity and our goal is to pack 2,000 commodity supplemental food boxes during that time. These commodity boxes go out each month to 4,000 seniors who live in your neighborhood,” said Teresa Cline-Scurlock, Community Relations Specialist. Cline-Scurlock said volunteers are essential to the foodbank. A program of Hocking Athens Perry Community Action (HAPCAP), the program provides food and other essential items to member agencies in 10 counties including Athens, Gallia, Hocking, Jackson, Lawrence, Meigs, Morgan, Perry, Vinton and Washington. Individuals, families groups and businesses interested in volunteering are asked to contact Teresa Cline-Scurlock at (740) 385-6813 or email at tcline-scurlock@hapcap.org.